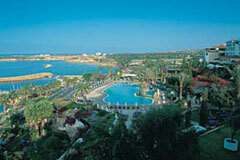 The Coral Beach is a 5 star hotel situated on 300 metres of natural sandy beach with its own private harbour and boat. It is 17 minutes from Paphos city centre, 35 minutes from Paphos International Airport and 1 hour and 30 minutes from Larnaca International Airport. Adjacent to the Akamas peninsula, an area protected by UNESCO, the Coral Beach Hotel & Resort offers the perfect base for exploration. This unique resort combines the traditional Cypriot decor of white walls and authentic woodwork with the modern amenities expected of a five star resort. All 421 rooms are equipped with individually controlled air-conditioning, balcony / terrace, direct dial telephone, message waiting system, smoke detector, satellite television, full length mirrors, in-house movies, en-suite bathrooms, Mini-bar and safe box. •	Coral Restaurant: The main breakfast room, with a choice of fresh fruit, hot and cold dishes to start the day. •	Calypso Restaurant: Offers an International flare and rich buffets. •	Romazzino: Serves Italian cuisine in a romantic setting. •	Limani Taverna: Situated by the hotel’s private harbor and natural sandy beach, the perfect setting for a meal by the waterfront. 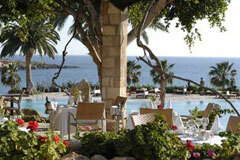 •	Molos Restaurant: Offers fresh seafood during the summer. •	Armonia Restaurant: An indoor courtyard, ideal for private dinners or cocktails. •	Dionyssos Bar: Offers the best location to enjoy the superb Paphos sunsets and nice cocktails. •	Odyssey Bar & Nightclub: Offers a pleasant atmosphere for socializing and enjoying a drink. •	Poseidon Pool Bar: Enjoy a light lunch by the pool. •	Beach Bar: Serves refreshments and light lunches. •	Shisha Experience: Enjoy flavorful shisha overlooking the harbor or gardens. 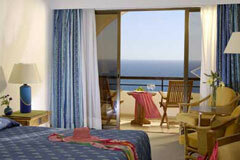 Coral Beach Hotel offers 13 conference rooms capable of accommodating up to 1000 people within 7,500sq. meters of meeting space, while incorporating over 20 flexible break-out or syndicate rooms with natural daylight. The hotel complex offers fun casino nights, exciting colourful cabaret shows, Olympic size outdoor swimming pool, an indoor swimming pool, Spa and gym centre facilities,4 floodlit tennis courts, water sports and a diving center.